So much to choose from! I narrowed my choices to the geometric patterns on the walls and the vased and the color of the flowers to come up with my card. And I filmed my card as I was making it - check out the video below. I stamped three background stamps onto scraps of white cardstock using Versafine Onyx Black ink and then die-cut them with the pierced square frame die. After stamping the flower onto X-Press It cardstock, I colored it with Copics and added some light pencil touches at the end. The sentiment was white-embossed onto black cardstock and die-cut with a slanted sentiment strips die. Then I spent forever trying to decide whether to have the frames straight, or at an angle. I had to cut that out of the video because this card took me 58 minutes from start to finish! If you want to see the process, you can head over to YouTube or watch below. I'd like to thank the JUGS team for inviting me to join them this month. Please head on over and check out the fabulous cards made by the DT and have a go yourself! I can't wait to see the gallery! 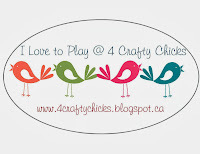 I'm linking this card to Simon Says Stamp's Wednesday Challenge, as well as Tic Tac Toe (Floral, Free, Thanks) and 4 Crafty Chicks CAS challenge. I love your inspiration for this card. I pinned it! I love your design, Karren! The black and white make those flowers pop! Thank you for playing along with us at the Simon Says Stamp Wednesday challenge! Great design and beautiful card. Love the way you arranged the die cut frames. Thanks for sharing the video. Love this card design. The interlocking squares are so eye-catching. Beautiful floral image as well. Thanks for being such a great JUGs guest this month! I've said it before... I'll say it again: you had me at Hounds Tooth! Those background stamps are fabulous, Karren. Using them to make black and white frames to place your beautifully colored flowers on was an outstanding design idea. It's been a pleasure having you as our guest designer and I hope we see you again in the gallery. You certainly have wowed us this month at JUGS Karren. 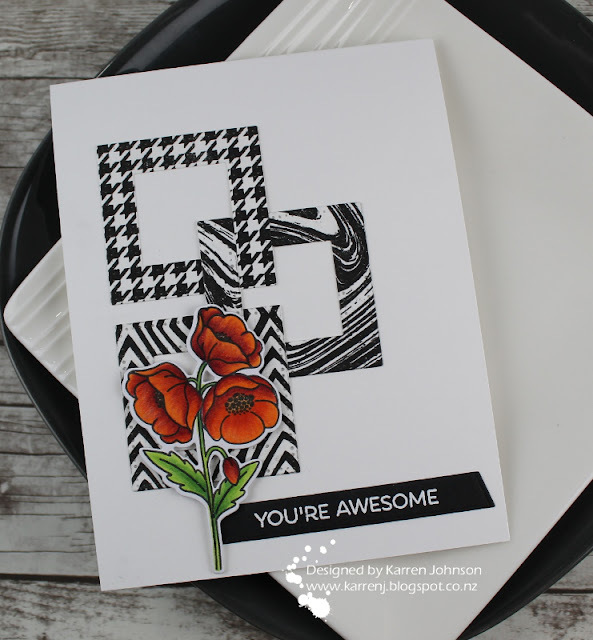 This card is stunning with those fabulous black and white squares. Not to mention the gorgeous orange flowers that are over the top spectacular. Thanks for sharing your talents with us. It was such a pleasure having you join us. This is fabulous! I love the patterns you stamped those cool frames with and how you lined them together and those gorgeous flowers. Fantastic video showing how you linked those frames together and how you colored those flowers. Thank you so much for joining us this past month and sharing all of your awesome creativity! STUNNING, I love the red poppy flower against the white background and those bold geometric square frames. So happy you shared your design with us this week over at Tic Tac Toe challenge. Great video as well. Going out with a bang! I just love the flower coloring -- Thanks so much for spending April with Just Us Girls! So glad you could guest with us! Love your take on the photo! Gorgeous frames and flowers! Oh I love this card - super classy and so elegant! You have been a delightful guest Karren! 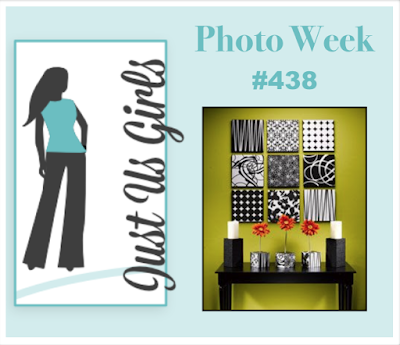 Your card is sensational and fits the inspiration photo beautifully! Thanks for being with us and we look forward to having you back in our gallery from time to time. 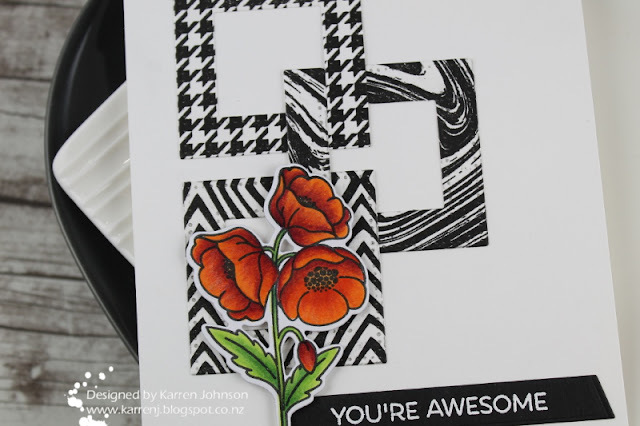 Gorgeous and so creative, Karren! Your Copic coloring on the flowers is just beautiful and I love your combination of patterns on the frames! You've done such a great job as a GD for the challenge this month...I've enjoyed seeing every one of your cards! Perfection! You nailed the inspiration photo for sure! Crisp,and elegant! Another amazing card, love the design and the red black and white. Stunning. Such a fabulous design. An amazing take on the challenge.